A vibrant biography of one of the greatest rock 'n' rollers, the America that made him, and the America he made. The book that defines a band that defined a generation. The leading text in the market, What’s That Sound? strengthens students’ listening skills and deepens their understanding of rock, first and foremost, as music. New listening guides and author videos reinforce this classic strength, while also providing additional historical and cultural context that allows students to make connections between the music and the times. 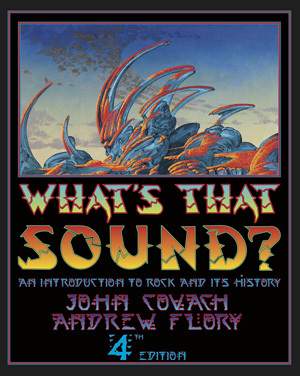 The text is rich with tools to aid students in approaching music, including What to Listen for in Rock, a thirty-page minihandbook on rock elements, forms, and technology. Listening guides—12 new to this edition and including Frank Sinatra’s “All or Nothing at All,” The Who’s “My Generation,” Donna Summer’s “Love to Love You Baby,” and Nine Inch Nails’ “Hurt”—present essential information, including the song’s chart ranking, form, rhythm, and instrumentation. “Viewing Rock” sections introduce students to the roles of rock music in several classic video performances, and “Sound Check” features span every chapter’s musical selections and detail each song’s primary characteristics. New author videos trace historical developments across all chapters of the text. Topics include Race, Markets, and Crossover; Rock and Politics; Gender and Rock; Majors vs. Indie; Technology in Rock; and Changing Attitudes toward Ambition and Virtuosity. Every chapter opens with a preview providing students a checklist of primary historical and musical developments, and each listening guide is accompanied by a new introductory video introducing each song’s origin, form, and instrumentation. Coverage of the 1990s has been increased to two chapters and now includes Nirvana and Seattle grunge, metal extensions, indie-alternative, and female singer-songwriters. The text also explores the emergence of rock bands via new festivals, the return of folk styles to the mainstream, the continued success of indie labels, and the tracking of cloud-based streaming services such as Spotify, Rdio, and iTunes Radio. Listening selections have been expanded to include songs by Foo Fighters, Alabama Shakes, Green Day, Beck, and Nine Inch Nails, and every chapter opens with a preview providing students a checklist of primary historical and musical developments. A robust instructor support package features music playlists, presentation content, materials for assessment, and additional readings and resources to aid in lecture and course management. Students can access the music through our Spotify playlists, links to iTunes, and Amazon downloads.